Take a look at today's market for utility interactive (UI) renewable energy systems. In the U.S. alone, utility interactive inverters capable of safely placing clean, independently-produced electricity onto your local utility grid are being sold and installed by the thousands. The grid intertied RE market is booming as Americans spend big money on state of the art equipment. In most cases, people are doing so without any hope that their system will ever provide a monetary payback. What's their motivation? For one thing, they want a cleaner environment and they are willing to pay for it. And with the addition of batteries, a UI system takes on a greatly expanded role as an uninterruptible power supply (UPS) for both residences and businesses. Homeowners now have the ability to back up critical household loads like well pumps, furnace blowers, freezers, computers, and lighting. Today's business environment absolutely requires an uninterruptible and high quality source of power, since information transfer is expected to be seamless. Think about it. Virtually every hospital, bank, and large business has invested in a UPS. The utilities' lack of confidence in their ability to deliver continuous high quality power is obvious as we watch them recommend surge suppressors and UPSs for customers with home computers. UI inverters give us the ability to safely place energy from the sun, wind, and water onto the utility grid and share it with our neighbors. UI inverters give our homes and businesses a source of electricity when the grid fails. UI inverters give some utilities a headache. Utility response to small-scale generation from renewable energy has ranged from caution to downright foot dragging. If you're living on-grid, you probably already know that your local utility has what amounts to a monopoly on the electricity you're buying. Don't like the service? Tough. Americans have had to resort to legislation in order to liberate clean energy from the grasp of repressive utilities. Currently, twenty-seven U.S. states have enacted net metering legislation, which forces utilities to pay their customers a fair price for independently produced renewable energy. However, even in states where net metering is law, many local utilities are making implementation so difficult that the laws are meaningless. Citing safety, reluctant utilities are skirting legislation by requiring UI customers to have excessive insurance policies and expensive, redundant safety equipment. It doesn't even stop there. This past year, utilities in both Maine and Iowa challenged state net metering laws, attempting to have them repealed outright. Fortunately, clean energy supporters handily defeated utility interests in both cases (see Bill Lord's article in HP65). Remember, as a utility customer in a net metering state, you are simply attempting to exercise your legal right to put clean electricity onto the local utility grid, and receive a fair payment for your investment. Take a look at today's market for utility interactive renewable energy systems. In the twenty-six states without net metering legislation, you'll begin to see RE systems being installed without the benefit of statewide legislation or even the approval of utilities. Take another look and you'll see that the number of installed UI systems in the U.S. may have just doubled. Regardless of the local utility's position, Americans are purchasing and installing UI inverters and renewable charging sources because it's the right thing to do. If you come up against a stubborn utility, you just might find yourself quietly hitting the "sell" button on your inverter. The result? De facto net metering without jumping through hoop one. It's painfully obvious that the technology of UI power systems—and the human ingenuity behind them—is outdistancing ineffective regulation and unwilling utilities. 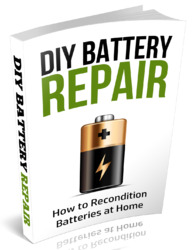 While most Home Power readers give a quiet nod to unauthorized or guerrilla RE systems, disregarding obstructionistic utilities is an uncomfortable position for some. What's their big issue? The safety of utility line workers, without exception. Modern synchronous inverter technology allows for safe and efficient home-based utility-interactive generation systems. These inverters are capable of synchronizing the frequency of their AC output to the waveform of the utility grid. The popular Trace SW series inverters, manufactured in Arlington, Washington, have revolutionized the grid intertie market and represent the majority of UI inverters currently installed in the U.S. Trace sine wave inverters are available for both battery-based UPS and battery-less applications. Battery-based UI units are available with outputs of 2,500, 4,000, and 5,500 VA (volt-amperes) at either 120 or 240 VAC/60 Hz. Export models are also available with 230 VAC/50 Hz outputs. Battery-less UI units offer outputs of 4,000 and 5,500 VA at either 120 or 240 VAC/60 Hz. Export models are also available for the battery-less UI units. If power demands are higher than the rated output of a single inverter, two battery-based units can be operated in series with the addition of a stacking interface cable. This configuration effectively doubles inverter output. Multiple inverters can be used for outputs of up to 30 KW. Can't afford 30 KW of PV right out of the gate? On the other end of the spectrum, Trace offers small synchronous inverters with a rated output of 100 VA. The MicroSine inverter is available with 120 or 240 VAC/60 Hz output. Again, export models are available. This synchronous inverter is designed for battery-less installations using one 24 VDC PV or two 12 VDC PVs. Advanced Energy Systems (AES) of Wilton, New Hampshire, also manufacturers a synchronous, module-integrated inverter with a rated output of 250 VA. In addition, AES is currently manufacturing the conveniently sized GC-1000 UI inverter, with a rated output of 1,000 VA. Both of these AES inverters are designed for battery-less, UI applications. All of these inverters have been tested and approved to meet the safety standards established by Underwriters Laboratories (UL). These listed products are certified to perform safely, as advertised. Because the Trace SW series inverters currently make up the majority of installed UI inverters in the U.S., their safety features deserve a closer look. The protective systems of the Trace SW series inverters are exceptional. These systems are designed to protect utility personnel and both private and utility owned power generation and transmission hardware. The protective features address all situations where disconnecting a UI inverter from a failed utility grid is essential, including open circuit, short circuit, and islanding conditions. The safety features specified by the manufacturer have been approved by all utilities who have undertaken testing of the inverters. No shortcomings in the units' protective circuity have been documented. In fact, in some applications, poor utility power quality has actually limited some customers from using their SW inverter in UI mode. The inverter's preset power quality parameters will not allow the unit to become synchronous with the utility if grid voltage varies +/-10 percent or frequency varies +/-2 Hz. To meet proposed IEEE (Institute of Electrical & Electronic Engineers) standards, an upcoming software revision will preset this frequency window at +/-0.5 Hz. Wind and ice storms take down power lines across the U.S. quite frequently. This typically results in either an open circuit, if the downed lines are cut, or a short circuit, if hot and neutral wires come into contact. In an open circuit condition, the Trace SW series inverter will disconnect from the utility grid within one second of the loss of grid power. If a short circuit occurs on the grid, the inverter will reach its overcurrent limit and disconnect its output from the utility in under four milliseconds. It's important to note that the inverter does not arbitrarily attempt to re-synchronize with the grid after a separation from the utility has occurred. Before reconnecting to the utility grid, the inverter monitors for excessive variations in either the frequency or voltage of the grid for eight seconds. If grid power quality is within specified parameters, the inverter's output will synchronize its waveform with the grid for an additional eight seconds. During this period, the inverter's microprocessor will continually monitor for unacceptable voltage and frequency variations, and phase angle differences greater than two degrees. Only after the grid is determined to be stable will the inverter open an internal relay and resume parallel operation with the utility. A slightly more complex safety concern related to UI inverter use is a condition called islanding. This refers to a fragmented utility grid where a UI inverter or engine generator could possibly energize the lines within this island. Imagine, for example, that the power lines were cut in two places, leaving you and your neighbor's houses connected to each other, but not to the grid. Your UI inverter or engine generator could theoretically energize the lines between the two houses. 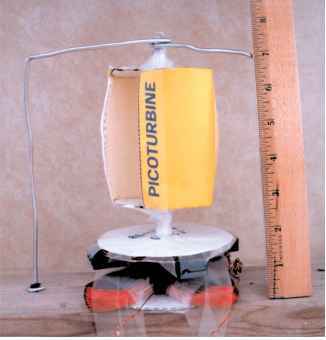 Islanding first became an issue when generators were incorrectly installed and backfed an islanded utility grid. Without the addition of advanced power conditioning equipment, most engine generators lack the control logic incorporated into all UI inverters, and will not disconnect from an islanded utility grid. Unfortunately, irresponsible generator use has both injured and killed utility workers. It has also made many utilities hesitant or straight out unwilling to allow any non-utility generated electricity onto the grid. Trace has eliminated the possibility of their UI inverters causing an islanded condition by incorporating an active islanding detection circuit. This circuit relies on a zero point crossing strategy to ensure disconnection from an islanded utility grid. The circuit monitors the waveform of the utility grid every time the sine wave crosses the zero point. That's approximately once every 16 milliseconds. If a loss of source is detected, the inverter is offline within one second. This hypothetical islanding situation can be stretched even further. Say your neighbor fires up an improperly installed engine generator and backfeeds the same fragmented grid. Your inverter would initially attempt to sync up with the output of the generator as if it were the utility grid. In this instance, the inverter relies on its over/under frequency and voltage circuits. Again, if the frequency varies +/-2 Hz, the inverter is offline in under one second. If the inverter senses +/-10 percent variation in voltage, it is offline in under one second. Trace Engineering's literature states that "since the inverter is locked onto the frequency of the islanded utility grid, the frequency of the system will drift out of regulation in a short amount of time during an islanding condition." The conclusion is that the islanded system will be overloaded in terms of generator/inverter capacity and that the frequency, voltage, or both will drop below spec, causing the inverter to disconnect from the islanded grid. But let's be clear—the inappropriate use of the engine/generator is the cause of this situation and the owner of that system should be held responsible. As an aside, Trace SW inverters have the capability of auto starting engine generators based on either preset voltage or time parameters. The inverter's control circuitry will not allow a connected generator to attempt to operate in parallel with the utility. Concerned Home Power readers have argued, "What if the inverter's protective systems fail and injure a line worker?" The protection circuitry of each Trace SW inverter is tested and certified before the unit is shipped from the factory. However, no equipment can be guaranteed never to fail, and Trace Engineering is aware of this. In addition to the safety functions of the inverter's main processor, five additional dedicated safety circuits continuously monitor the main processor. In the unlikely but not impossible event of a main processor failure, these circuits will immediately shut down the inverter and will not allow it to restart. You might ask, "What if all five of these protective circuits fail?" To threaten a line worker's safety, all of the inverter's redundant safety features would need to fail simultaneously. With thousands of UI inverters installed, this type of catastrophic failure has never occurred. In addition, this undocumented failure would need to occur while the inverter was feeding electricity onto the grid, within 16 milliseconds of a grid failure, and the inverter would need to synchronize with a utility grid that doesn't even exist. Finally, in order to be injured, utility line workers would have to ignore the same protocol they rely on every day they are in the field (assume that it's hot, and ground all potentially energized conductors). Remember, utility workers are trained professionals and routinely work under hazardous conditions. Utilities are responsible for the well-being of their line workers and they need to be thorough when evaluating the safety features of unfamiliar equipment. Our obvious first step is to educate inexperienced utilities regarding the power quality and redundant safety features modern synchronous inverters incorporate. If a given utility is still reluctant to approve an installation for reasons of safety, then their motivation is suspect. What else could possibly motivate them? Try money and control. Utilities despise the thought of having their rates legislated, but then they're the ones that make this a necessity in the first place. Many utilities will also assert that the transmission of your renewable energy amounts to a subsidy and that it is unfair to expect the utility or its entire rate base to bear this cost. You can point out that they don't seem too concerned about the entire rate base breathing their pollution. And don't fail to mention that U.S. utilities have been subsidized from day one. Federal subsidies fund the construction of their dams and transmission lines. U.S. citizens subsidize the utilities with our tax dollars as we undertake the nearly impossible task of revitalizing dead salmon runs and cleaning up their failed nukes. All we ask is that the utilities place our renewable energy onto the grid and pay us a fair price for our investment. It sure doesn't seem like too much to ask. And if you do ask, and your local utility plays obstructionist, you will find yourself facing the same decision hundreds of other Americans continue to face. How important is clean, renewable energy, and does the utility have a responsibility to distribute it? In a perfect world, the utilities would welcome our renewable energy onto the grid and there would be no need for unapproved, guerrilla RE systems. The funny thing is that the people the utilities are so concerned about are the very ones trying to make the world a little more perfect. Anyone interested in installing a utility interactive RE system should have a thorough understanding of what makes a given system safe. Ask your equipment supplier any specific questions you may have. If you come up short, try the equipment manufacturer or your local utility. If you still have any doubts, then hire a local RE dealer to install the system for you. Here's a checklist for anyone planning to install a UI system. • All products used in your system should carry a UL or equivalent listing. This ensures that the gear that you, your neighbors, and utility line workers are relying on has been certified to be safe. • Your system should be installed to meet NEC code. This includes appropriate wire sizing, fusing, disconnects, and equipment accessibility and clearance. Your system should also be inspected by your local electrical inspector. This inspector is concerned primarily with fire safety and typically does not operate in conjunction with utility personnel. • Above and beyond the UL certified safety capabilities built into utility interactive inverters, both the NEC and utilities typically require either a manual disconnect or a satisfactory visible open point at the location of interconnection. This establishes a means for utility workers to disconnect all on-site sources of power generation. Accepted options range from utility workers simply removing the meter from the meter base and capping it off, to providing a separate, lockable disconnect that only utility personnel can access. • The means of disconnect should be clearly labeled as such, for example "Solar Electric System Disconnect." • An attempt should be made to get approval for your UI system from your local utility. The more aware and educated the utilities are regarding the use of UI inverters, the more commonplace they will become. Currently, twenty-four states offer net metering for RE systems. But beware—local utilities can make approval of your system virtually impossible even with net metering legislation in place. This scenario forces customers to either go guerrilla or worse yet, abandon their project altogether. Morningstar's SunGuard. The most advanced small, economical solar charge controller on the market today. 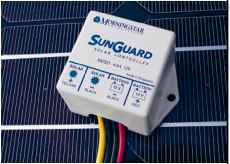 The SunGuard delivers the same quality and performance as the world-leading SunSaver controllers. Dankoff Solar has been serving the renewable energy industry since 1983 as a manufacturer and distributor of the finest solar pumps available. We offer full service dealer support including engineering, marketing, and qualified leads; and we NEVER compete with our dealers. We carry a huge inventory of panels, inverters, controllers, racks, and pumps from the very best manufacturers. For a free tech tips newsletter call us at 888-396-6611 (dealers only please). 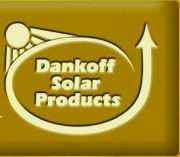 Dankoff Solar Products, Incorporated, 2810 Industrial Rd., Santa Fe, New Mexico, 87505. U.S.A Phone: 505-473-3800, Fax: 505-473-3830, E-mail: [email protected].